In medieval times, markets and fairs had been closely regulated. The right to hold one had to be granted by the Crown. By the 18th and 19th centuries, regulation was less strict. 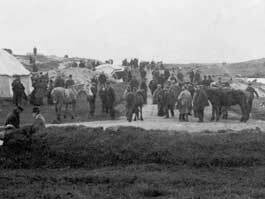 The cattle and pony fair at Ormiclate took place on the third Wednesday in July and the first Wednesday in September. This photograph was taken in 1897. In remote areas such as this, fairs were a means of trading produce – without the expense of transporting it to distant mainland markets. The site is still marked on Ordnance Survey maps as 'Market Stance'.